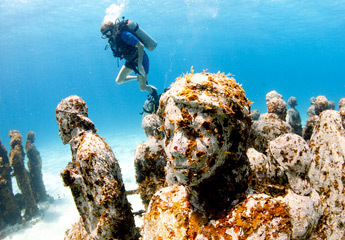 We dive at 18 diferent reefs, ship wrecks, and the Underwater Museum (Wednesdays, Fridays & Sundays are the Museum dive days). You must be a certified diver for these dives. DOES NOT INCLUDE $3 per person reef tax. Reefs attract an incredible amount of sea life, including many different types of tropical fish, rays, turtles, shellfish and many more types of fascinating marine species. 30 ft Reef Dive. 1:45PM Daily.